This is the famous Winnie the Pooh Story based on Winnie the Pooh series by Walt Disney. Winnie the Pooh lived with his friends in the Hundred –Acre Wood. 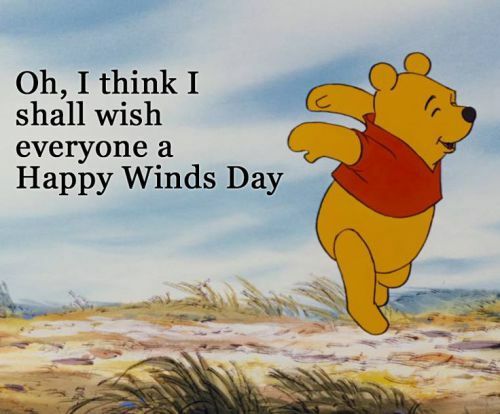 One fine day, when Winnie the Pooh woke up, he realized the day was extremely windy. “I should visit my thinking spot,” decided the fluffy bear. And out of his bed, Winnie flew, quickly gathering his things and marching off to his thinking spot. “What a blustery day today is,” he chuckled happily. Image Source@ Pinterest. “Windsday?” Pooh asked. At first, he was surprised, but then finally he had a brilliant thought, “I will go, wish everyone a happy Windsday!” Pooh announced and left for Piglet’s house immediately. Pooh found Piglet sweeping away the fallen leaves on this blustery day. Piglet had managed to sweep away the last of the leaves when a huge gust of wind brought back all the leaves again. “Happy Windsday Piglet!,” Pooh announced. Just then another strong gust of wind blew. This time it took Piglet along with all the leaves. “This… isn’t happy for me!” poor little Piglet cried. “Where are you going, Piglet?” Pooh asked, surprised. “I don’t know! Help me Pooh!” cried Piglet as he floated away. 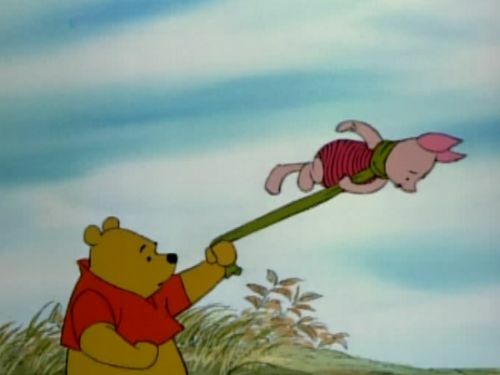 Pooh grabbed onto Piglet’s scarf before Piglet could fly out of reach. Wherever Piglet floated, Pooh ran after him. Piglet flew like a kite in the sky. Pooh and Piglet went right through Rabbit’s carrot patch. They made carrots fly everywhere, making Rabbit very angry. Then, the wind grew even stronger. And with the strongest of them all, Pooh and Piglet were thrown right at the Owl’s window. Looking at the two, the Owl became happy, “What a pleasant surprise,” the Owl chimed. “Do come in,” the owl opened the window and let them in.The wind continued getting stronger. And finally, the owl’s house was brought down. All the people of the Hundred-Acre Wood came to help. But no one knew what to do. In the end Eeyore, the donkey had the best idea, “I say, it’s time to look for a new house.” Sadly, everyone had to agree. So, Eeyore gave the job of finding a new house to the Owl. Finally, the night came and it was a blustery night. Poor Pooh could not fall asleep. As much as he tried sleep would not come. Strange noises made Pooh very uncomfortable. Finally, Pooh got up to investigate. He opened the door with trembling hands and asked, “Who’s out there?” Pooh hoped wholeheartedly that no one replies. Image Source@ Pinterest. At that very moment, bounced in a strange looking animal. Orange in color, with black stripes all over, “Tigger is my name!” it said cheerfully. “Oh,” Pooh replied, “You scared me!” Tigger laughed and said, “Everyone is scared of Tiggers.” “What’s a Tigger?” inquired Pooh. Tigger jumped around on his springy tail, showing what he could do. “I am hungry,” Tigger said. “I hope not for honey,” Pooh said sadly. Luckily, Tigger hated honey. So, Tigger left Pooh and sprang away. The blustery night turned into a rainy night. By the time morning came, the Hundred-Acre Wood was flooded! Pooh was scared his honey pots would all go to waste. So, he decided to eat them. But, as Pooh was licking the last of honey from the last pot upside down in the pot, the water took Pooh and his honey pot away. Piglet was struggling at his house too. The water was flowing in through the window. Poor Piglet wrote a note for help and put it in a bottle. Then, he threw the bottle in the water. “Someone will surely come to rescue me,” he hoped. Everyone from the Hundred-Acre Wood had gathered around Christopher Robin. Christopher Robin lived on a high hill, where the water could not reach. Soon, he found Piglet’s note and sent Owl to find Piglet. When Owl was flying over the flooded woods, he saw two objects. You may also like to read, Dumbo, The Flying Elephant Story. As soon as the party for Pooh began, Eeyore arrived. “I have found a new house for Owl,” he announced. Everyone followed Eeyore, and to their surprise, Eeyore stopped in front of Piglet’s house. Before Pooh could say anything, Piglet gave up his house to Owl. “Then Piglet, you shall stay with me!” Pooh said happily. Christopher Robin smiled and said, “Piglet, that was a very grand gesture,”. And so, the hero party was thrown not for one hero, but for two heroes! Pooh rescued little Piglet, who in the end saved Owl by giving him his home! Also, read Tarzan Story. Hope you liked the story. Here is a visual depiction of the famous, “Winnie The Pooh Story”. See the video story below.